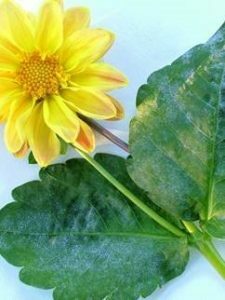 Pest: Powdery mildew – Various genera including Oidium, Erysiphe, Leveillula and others. Symptoms: White powdery appearance on infected host tissue. Usually on upper leaf surfaces, but can also be on stems and underside of leaves. Lesions start as small, circular, white, powdery patches. The fungus can quickly cover both leaf surfaces. Young infected growth is distorted or puckered while leaves may turn yellow, shrivel and die. Transmission: Produces air-borne spores which are released into the air when temperatures are moderate and there is a drop in humidity. Spores are spread with air movement, but not over long distances. Favoured by: Humid nights with temperatures of around 15oC combined with day temperatures above 26oC with low humidity. Spores can germinate and infect plants without surface wetness, but germination is favoured when humidity is high. The fungus flourishes in dry, warm and shaded conditions. Host range: Wide host range. Each species of powdery mildew is usually restricted to a single plant host or family.